I love peaches. They are in season at the peak of summer. Unfortunately I developed some kind of allergy in recent years. I can't eat them raw more than one or two at a time, but if they're baked or cooked I'd do just fine. My favorite cake for peaches is still a galette I posted here three years ago. It's always the first thing I make when they are the season. This year I paired peaches with blackberries. It was a big hit. Being such a summery fruit, I always associate them with the Mediterranean. Usually the peaches we get in Germany are grown in either Italy or Spain. These little muffins here convey this Mediterranean summer feeling perfectly, with the best this region has to offer. 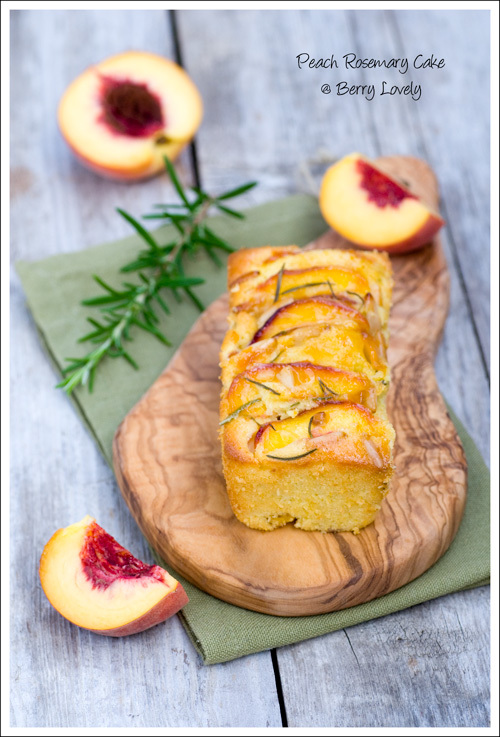 Juicy and sweet peaches are combined with rosemary, pine nuts and olive oil. They are perfect to be enjoyed for the last summery days. Instead of muffins, you can also bake them as mini loaves. Preheat oven to 200°C (400°F). Line a 12 cup muffin pan with paper liners. With a hand-mixer whisk together the eggs, sugar and lemon zest. Add the olive oil, orange and lemon juice while continuing whisking. Mix together the flour, baking powder and corn meal and whisk into the batter. Finely chop half of the rosemary needles. Wash and dry the peaches. 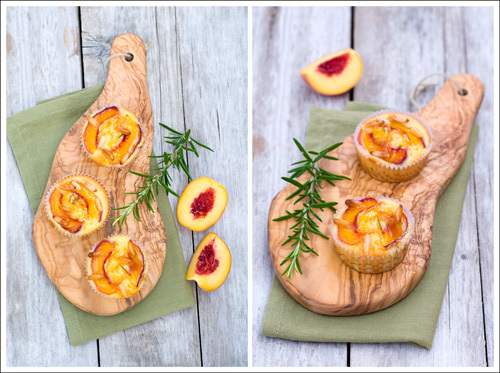 Cut one peach into small pieces, cut the other one into thin slices (you should have 24 slices). Fold the chopped rosemary and the peach pieces into the dough. Fill the dough into the muffin pan. 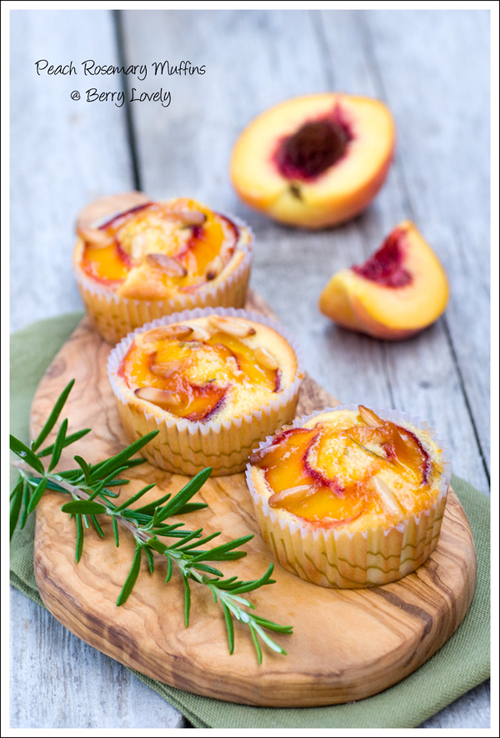 Lay two peach slices on top of each muffin and sprinkle with the remaining rosemary and the pine nuts. Bake for about 20 minutes. Warm up the jam and spread on the hot muffins, as soon as they are ready baked. Let cool in the pan for about 10 minutes then remove and let completely cool on a wire rack.